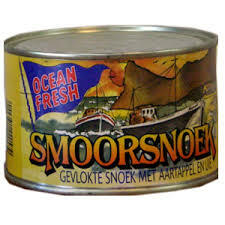 The snoek or Thyrsites atun to give it its correct name, is a long, thin, species of snake mackerel found in the seas of the Southern Hemisphere. 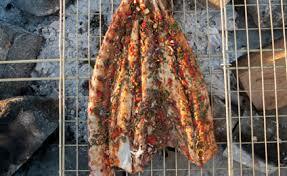 The fish is a firm favourite with many because of its flavour and is use often when braaing (barbequing) on a hot fire. This is a traditional South African recipe originally comes from the Cape Malay community. This classic dish of potatoes in an onion, tomato and chilli sauce finished with flaked, tinned snoek. 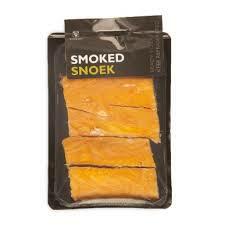 I prefer to use the fresh smoked fish, which is served hot on a bed of rice along with a seasonal fresh fruit salad. It can also be used as a sandwich filling or as a breakfast spread over hot, buttered, toast. Heat the oil in a pan, add the onions and fry for about 8 minutes, or until golden brown. Add the tomatoes, then bring to a simmer and cook until you have a thick sauce (about 10 minutes). Pound together the garlic and salt in a mortar then add to the tomato mix along with the chillies, sugar and potatoes. Bring back to a simmer, cover and cook for about 15 minutes or until the potatoes are tender. At this point, stir in the flaked fish. Bring back to a simmer and cook, covered, over medium heat for 10 minutes. Serve hot on a bed of rice. Alternatively, mash the potatoes into the mixture, take off the heat, and allow to cool. Serve as a sandwich filling or a breakfast spread on toast.